Liposuction is a popular procedure in the UK with many clinics in London and the UK offering liposuction to remove double chins. Typically Tumescent liposuction is performed when the patient is under a local anaesthetic which reduces the recovery time and risk of potential complications substantially. Why Should You Do Liposuction? Liposuction in the UK is being used increasingly by patients who cannot seem to shift those irritating pockets of fat around the body by dieting or exercise. An example of such a collection of fat cells can be found under the chin in what is referred to as a double chin. A double chin can make an otherwise slim person, appear out of shape and really affect a person's confidence. Are You A Suitable Candidate For Liposuction? Doing facial exercises may help reduce fat, and leading a healthy lifestyle should keep your body fat low, reducing the appearance of a double chin. However, if you are within 30% of your ideal body-weight and feel you are plagued with excess fat that you are unable to get rid of, it is worth discussing your options with your GP. 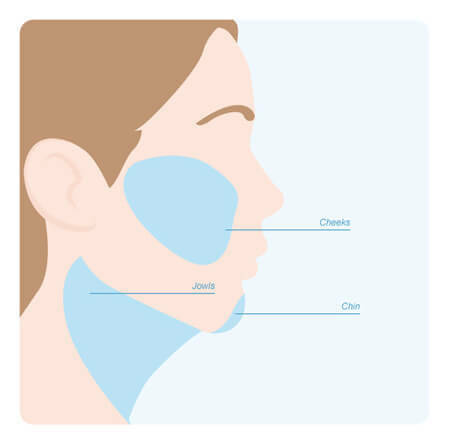 What Part Of Your Chin Can Be Treated? As well as reducing the appearance of a double chin with liposuction, fat can also be removed from the cheek. In fact, an area of the face called the Buccal fat pad, located just under the cheek bones, can be removed entirely. This thins the face and gives a hollow cheek appearance. Typically, most surgeons in the UK will recommend using either VASER, laser or CoolSculpting to remove stubborn pockets of fat surrounding the chin and the cost of these treatments range from £2,600 to £6,000 depending on the size of area being treated. The cost of double chin liposuction will vary according to the clinic performing the procedure as well as the location. Liposuction clinics in London that perform double chin liposuction may charge more than clinics in rest of the UK partly because rent and salary costs are generally greater in London. How Effective Is Chin Liposuction? The effectiveness of chin liposuction can vary greatly. This can depend on a whole host of factors such as the technique used, the skill of the surgeon and the patient's own capacity to heal. Problems can also arise that limit the effectiveness of chin liposuction. These usually occur when too much fat is removed, creating facial deformities and uneven skin. Other problems which may limit effectiveness include excessive swelling that does not reduce after a few weeks of healing. This can be down to either surgical technique or the patient's own capacity to heal. The wearing of compression garments is often recommended to avoid this. Chin liposuction is sometimes carried out in conjunction with other procedures, such as facial liposuction, botox injections and face lift. This can also determine how effective the procedure is. However, if you use a highly skilled surgeon, the likelihood of a successful procedure does increase, and the only people who can really determine overall effectiveness are the individual patients who should follow the clinics advice and guidance for post-operative care. Laser liposuction is the ideal way of addressing stubborn fatty areas in delicate parts of the body due to the gentle way the procedure's performed. Small incisions are made in the skin and a saline solution is injected to help minimise swelling and reduce bruising. A laser is then used to dissolve fat tissue in the area to be treated and ultrasound waves are used to break up any fatty deposits. Each area takes around 15 minutes to treat and as only local anaesthetic is used most patients can go home within the same day. Patients will require a couple of days off work to recover and will be required to wear a compression garment to help reduce swelling and promote a healthy result. Results will be visible up to a few weeks after treatment after the slight swelling and bruising subsides. Laser liposuction is ideal for treating small stubborn areas of excess fat and, for many practitioners, is the procedure of choice for treating a double chin or any other sensitive area of the body. Before a laser liposuction procedure, the area to be treated is rubbed with a an antibacterial solution and the area is marked with a pen. Then a series of small incisions are made through which the cannula can operate. The surgeon will advise that no food or drink be consumed after 24 hours prior to the operation and ask you to reduce your intake of alcohol and cigarettes up to 2 weeks before surgery as a precaution. The local anaesthetic used in the procedure will be administered via a needle, causing only minor discomfort. After a liposuction procedure the patient may experience light to moderate swelling or bruising which should be of a temporary nature. A compression garment will be provided as part of your aftercare package and should be worn to help apply a little pressure to the area, helping to speed up the recovery process and improve results. Patients may experience bruising and swelling for a couple of weeks following surgery. They should avoid rigorous activity or sports for a few weeks after surgery to help aide the healing process. What Are The Potential Risks Of Chin Liposuction? adverse reactions to anaesthesia and other medications. Above, Mr David Floyd, Consultant Plastic Surgeon at the Royal Free Hospital, discusses whether scarring occurs as a result of liposuction treatment. "There’s very little scarring, you have to make a 3-millimeter cut to put the tube in, in several areas, and those usually leave a little red mark that will then fade back to normal skin color, but the scarring is negligible. Once the scar is faded usually no one will see it." Risks that are specific to chin liposuction are infection, numbness of the mouth and jaw area due to nerve damage, bruising, aged skin appearance, uneven and bumpy skin, deformity of the chin and jaw area and scarring. The risk of nerve damage is particularly associated with any facial liposuction procedure as there are a network of nerves close to the skin in the face. However, the specific technique used, together with the skill of the surgeon, can sometimes reduce some of this risk. For instance, the use of local anaesthetic reduces the risk of a reaction to general anaesthesia, and a gentle and non-aggressive surgical technique can limit scarring and bruising. Removing all the fat in the chin area is not recommended by all doctors. Some suggest that leaving a little fat in place can help reduce the appearance of aged and uneven skin and create a more natural look. Techniques like tumescent liposuction and laser liposuction drastically reduce the risk of excessive blood and fluid loss as they require only small incisions under local anaesthesia. This can also reduce the risk of blood clots. Cosmetic surgery abroad is often offered at a fraction of the price that one would pay in the UK. In Poland or the Czech Republic, liposuction prices start from under £1,000 and in Latvia for just over £1,000. Again prices vary depending on the size of the area treated, but additional costs such as travel and travel insurance must of course be factored in. Non-invasive techniques are also being used in many countries in Europe and further afield, making travel abroad an interesting option for those looking for cosmetic work to be done on the chin area.